When your own kitchen cabinet design is where you want the focus, the Chef Built-in is the range hood to choose. The Chef Built-in 600 CFM Ducted Under Cabinet Range Hood combines quiet and powerful ventilation with a sleek design that blends perfectly with every kitchen design. It is ready to fit today's modern lifestyle. This chic and modern range hood design is the essence of the European lifestyle with its clear tempered glass extending from a distinctive 430 stainless steel body offering home owners a high end look to create the kitchen of their dreams at an affordable price. This range hood features quiet performance, eco-friendly LED lights and easy to clean filter. The Ancona GCP430 combines the power required and ease of use with the look and feel of luxury. This stainless steel insert range hood offers high performance ventilation with its powerful 600 CFM internal blower motor. The electronical push-button controls activate the 3-speed blower and the two 2 W LED lights. The unit also features two reinforced aluminum micro mesh filters to efficiently remove grease and heated vapours from the air. 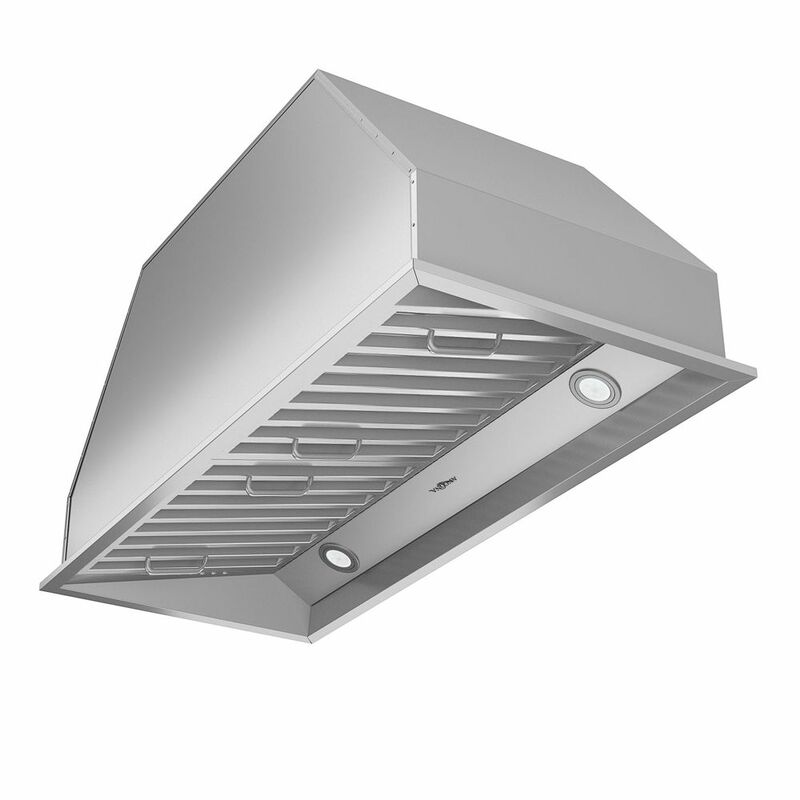 Designed for a standard ducted vertical exterior installation, the hood integrates a 6" circular exhaust duct connection. Glacier Series. The uncompromising choice. Air quality is a top concern for today's families. The Broan series, with its superior capture efficiency, is the ideal solution. This model is sure to win over even the most demanding users with its innovative design, advanced technology, and unmatched performance. Designed with an emphasis on style, this modern-looking, sleek fan is a subtle yet dramatic addition to any assortment of kitchen appliances. Features nonstick-coated fan blades that separate the grease from the airflow and can be controlled independently of each other. Utilizes grease cups for hassle-free collection and disposal of grease without messy filters that reduce power. With an emphasis on style, this modern-looking, sleek fan is a subtle yet dramatic addition to any assortment of kitchen appliances. Features nonstick-coated fan blades that separate the grease from the airflow and can be controlled independently of each other. Utilizes grease cups for hassle-free collection and disposal of grease without messy filters that reduce power. Chef Built-In 34 inch Range Hood in Stainless Steel When your own kitchen cabinet design is where you want the focus, the Chef Built-in is the range hood to choose. The Chef Built-in 600 CFM Ducted Under Cabinet Range Hood combines quiet and powerful ventilation with a sleek design that blends perfectly with every kitchen design. It is ready to fit today's modern lifestyle.